New Home Sales consultants are normally hired by the real estate sector and these professionals assist the customers in finding and buying new properties. 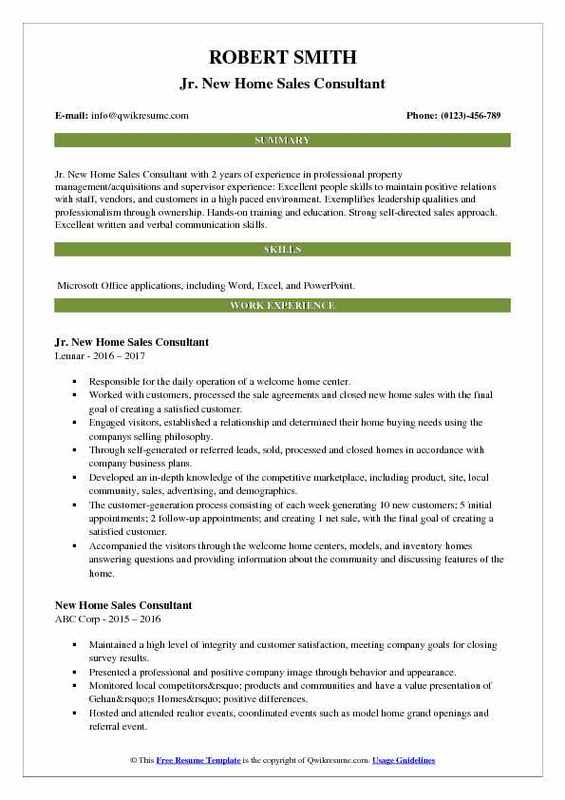 A professional New Home Sales Consultant Resume emphasizes on various tasks such as – identifying the property needs of the clients, consulting with clients, presenting new homes or buildings for the potential buyers, giving details of the building like – pros and cons of the location, etc; completing paperwork and attaining monthly sales target. 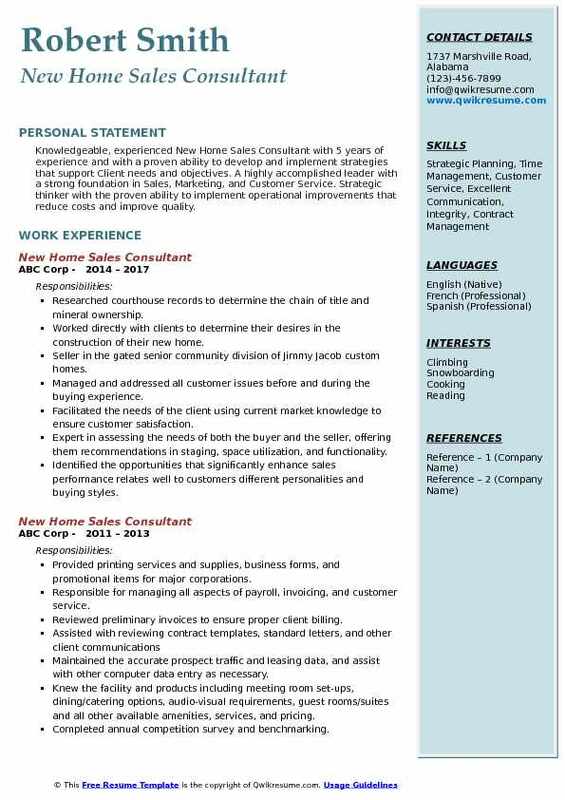 Candidates interested in this line of operation should depict in the resume skills and abilities such as – selling capabilities, excellent communication skills, honesty, integrity, the ability to understand the needs of the client, and staying abreast of the latest rules and regulations governing purchase and sales of properties. Having a high school diploma with some knowledge of the real estate industry paves a way for this career; however, it is imperative that the candidates’ posses prior experience become a good contender. 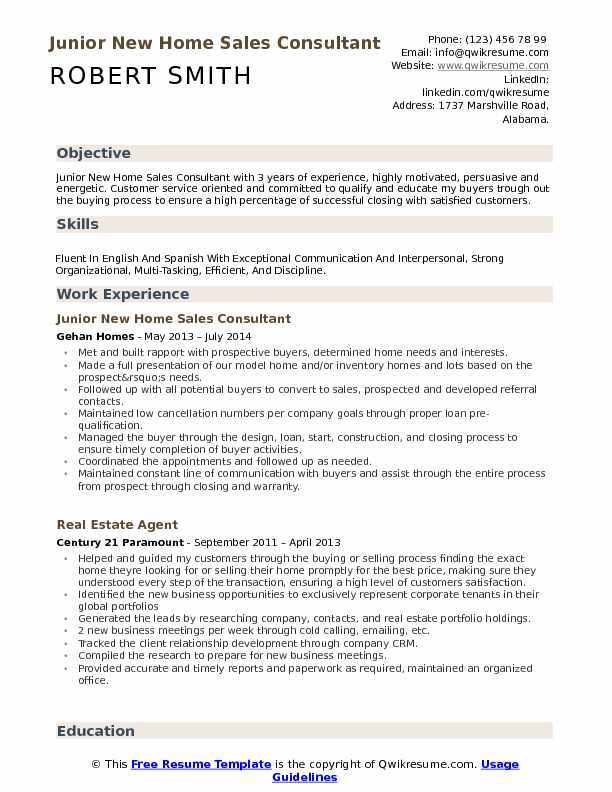 Objective : Junior New Home Sales Consultant with 3 years of experience, highly motivated, persuasive and energetic. Customer service oriented and committed to qualify and educate my buyers trough out the buying process to ensure a high percentage of successful closing with satisfied customers. Skills : Fluent In English And Spanish With Exceptional Communication And Interpersonal, Strong Organizational, Multi-Tasking, Efficient, And Discipline. Met and built rapport with prospective buyers, determined home needs and interests. Made a full presentation of our model home and/or inventory homes and lots based on the prospect’s needs. Followed up with all potential buyers to convert to sales, prospected and developed referral contacts. Maintained low cancellation numbers per company goals through proper loan pre-qualification. Managed the buyer through the design, loan, start, construction, and closing process to ensure timely completion of buyer activities. Coordinated the appointments and followed up as needed. Maintained constant line of communication with buyers and assist through the entire process from prospect through closing and warranty. Kept the customer informed of the status of home at each stage of the process. 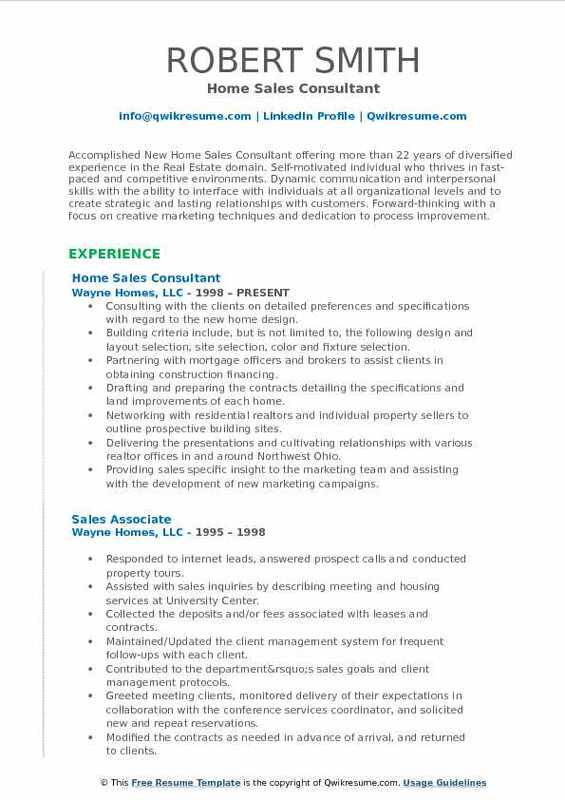 Summary : New Home Sales Consultant III with 21 years of experience in the Real Estate domain is seeking to support an energetic organization where I can grow to be a leader, influencer, and activator in sales, servicing and client deliverables. My goals are to work with forwarding thinking professionals to deliver excellence. Sold new construction homes to prospective homeowners, the price point of $300k-$700k. Worked to secure financing, product selections, project meetings, closings and new home delivery. Managed community sales, signage, project development, new prospects, networking events and realtor activities to drive increased revenue and positive business to the community. During the first four months in Terra Costa, I sold over $2 million in inventory to realize 1st quarter sales. Currently drives for the financial success for the community and the organization. Worked to ensure a backlog of sales averaging $2-3 million per quarter in closings. Obtained MLO licenses through the NMLS (National Mortgage Loan Services) for the following states: FL, GA, CA, AL, MS, TX, AR, OK, IL, OH, WI, NH, MT, WA, OR, NV, MI, KY, TN, IN, PA, CO.
Sold mortgages services to new and current borrowers. Took inbound and outbound calls to complete initial loan applications, coordinate closing files, coordinate with loan processors and followed up on completed customer files. Objective : Jr. New Home Sales Consultant with 2 years of experience in professional property management/acquisitions and supervisor experience: Excellent people skills to maintain positive relations with staff, vendors, and customers in a high paced environment. Exemplifies leadership qualities and professionalism through ownership. Hands-on training and education. Strong self-directed sales approach. Excellent written and verbal communication skills. Skills : Microsoft Office applications, including Word, Excel, and PowerPoint. Responsible for the daily operation of a welcome home center. Worked with customers, processed the sale agreements and closed new home sales with the final goal of creating a satisfied customer. Engaged visitors, established a relationship and determined their home buying needs using the company's selling philosophy. Through self-generated or referred leads, sold, processed and closed homes in accordance with company business plans. Developed an in-depth knowledge of the competitive marketplace, including product, site, local community, sales, advertising, and demographics. The customer-generation process consisting of each week generating 10 new customers; 5 initial appointments; 2 follow-up appointments; and creating 1 net sale, with the final goal of creating a satisfied customer. Accompanied the visitors through the welcome home centers, models, and inventory homes answering questions and providing information about the community and discussing features of the home. Summary : Accomplished New Home Sales Consultant offering more than 22 years of diversified experience in the Real Estate domain. Self-motivated individual who thrives in fast-paced and competitive environments. Dynamic communication and interpersonal skills with the ability to interface with individuals at all organizational levels and to create strategic and lasting relationships with customers. Forward-thinking with a focus on creative marketing techniques and dedication to process improvement. Consulting with the clients on detailed preferences and specifications with regard to the new home design. Building criteria include, but is not limited to, the following: design and layout selection, site selection, color and fixture selection. Partnering with mortgage officers and brokers to assist clients in obtaining construction financing. Drafting and preparing the contracts detailing the specifications and land improvements of each home. Networking with residential realtors and individual property sellers to outline prospective building sites. Delivering the presentations and cultivating relationships with various realtor offices in and around Northwest Ohio. Providing sales specific insight to the marketing team and assisting with the development of new marketing campaigns. Revising and updating the company's training manual for new home consultants and administered training to more than ten new hires. Ranked top 5 in company sales and top 3 in gross margin from 2000 through 2009. Wayne homes. Selected as Wayne homes corporate representative to attend the International Builders Show, 2007. 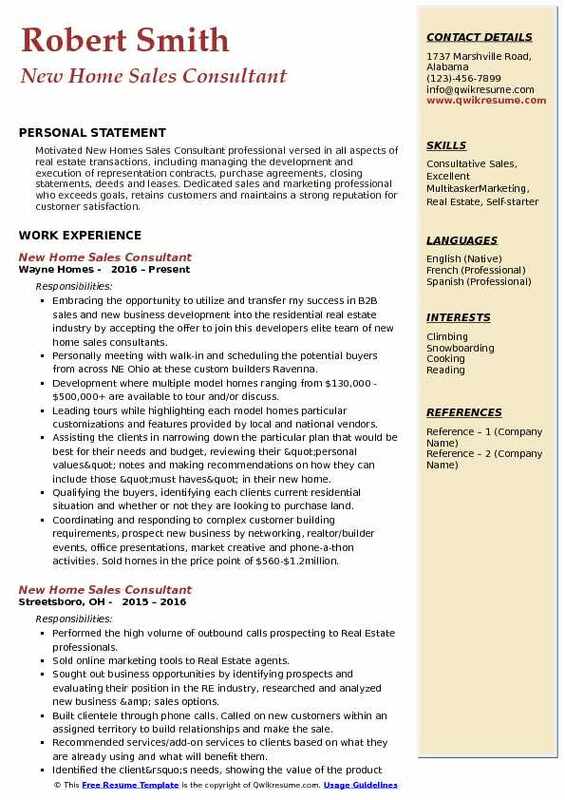 Headline : Knowledgeable, experienced New Home Sales Consultant with 5 years of experience and with a proven ability to develop and implement strategies that support Client needs and objectives. A highly accomplished leader with a strong foundation in Sales, Marketing, and Customer Service. Strategic thinker with the proven ability to implement operational improvements that reduce costs and improve quality. Researched courthouse records to determine the chain of title and mineral ownership. Worked directly with clients to determine their desires in the construction of their new home. Seller in the gated senior community division of Jimmy Jacob custom homes. Managed and addressed all customer issues before and during the buying experience. Facilitated the needs of the client using current market knowledge to ensure customer satisfaction. Expert in assessing the needs of both the buyer and the seller, offering them recommendations in staging, space utilization, and functionality. Identified the opportunities that significantly enhance sales performance relates well to customers different personalities and buying styles. Increased sales 120% in first 18 months managed multi-city territory and established new accounts. Sold diverse product line of printing developed substantial, profitable repeat business and delivered high-quality service. 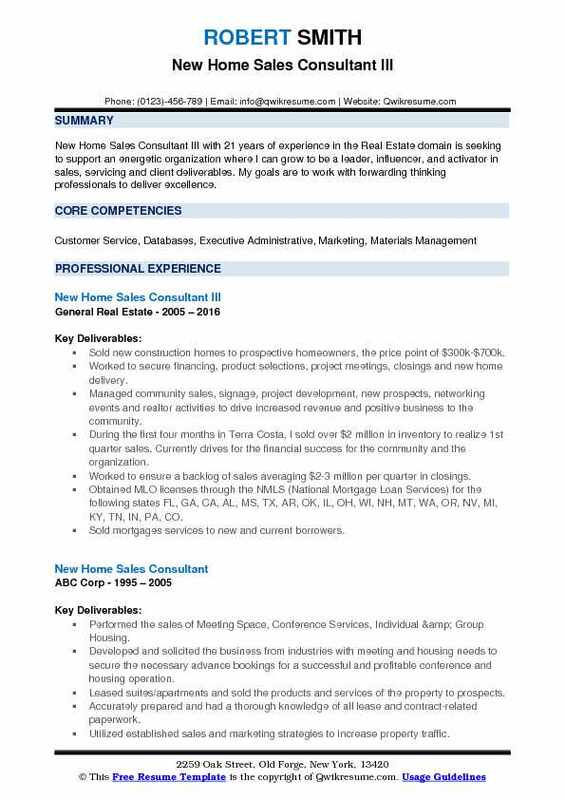 Objective : Highly organized, detail oriented and driven New Home Sales Consultant with over 3 years of experience in the Real Estate Domain. Experienced in training, mentoring, sales and management. Skills : Sales, Marketing, Negotiation, Customer Service, Communication, and Competitive Market Analysis. As builders agent, utilized effective marketing, and customer service skills to sell new semi-custom single-family homes valued from $275,000 to $450,000. Promoted and marketed the new home community to realtors, greeting, showing homes and pre-qualifying buyers. Obtained the buyer design selection specifications, negotiated, prepared and closed the sales contracts. Educated the customers on construction processes and timelines. Utilized CRM computer system and Windows, Microsoft Word, Excel and Outlook software. Entered/accessed data, communicated with the realtors, prospects, and customers. Prepared project tracking reports, following up with clients to ensure satisfaction, retention, and referrals. Ensured model homes and community showcase quality controls. Positioned the required knowledge of technical construction process, builder upgrades, and options. Consistently met and exceeded builder sales, closing, and referral goals. 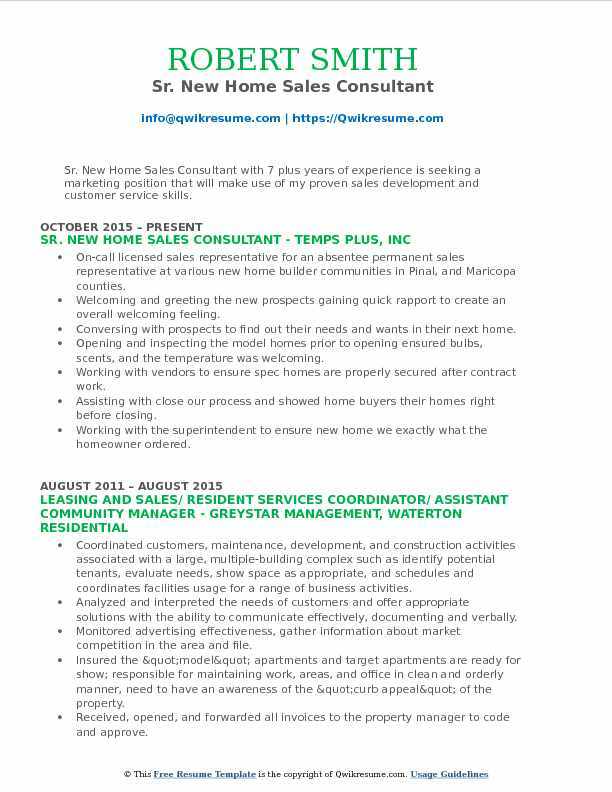 Summary : Sr. New Home Sales Consultant with 7 plus years of experience is seeking a marketing position that will make use of my proven sales development and customer service skills. On-call licensed sales representative for an absentee permanent sales representative at various new home builder communities in Pinal, and Maricopa counties. Welcoming and greeting the new prospects gaining quick rapport to create an overall welcoming feeling. Conversing with prospects to find out their needs and wants in their next home. Opening and inspecting the model homes prior to opening ensured bulbs, scents, and the temperature was welcoming. Working with vendors to ensure spec homes are properly secured after contract work. Assisting with close our process and showed home buyers their homes right before closing. Working with the superintendent to ensure new home we exactly what the homeowner ordered. Assisting the future homeowners with completing time-sensitive documents and worked with various vendors to ensure received in a timely manner. 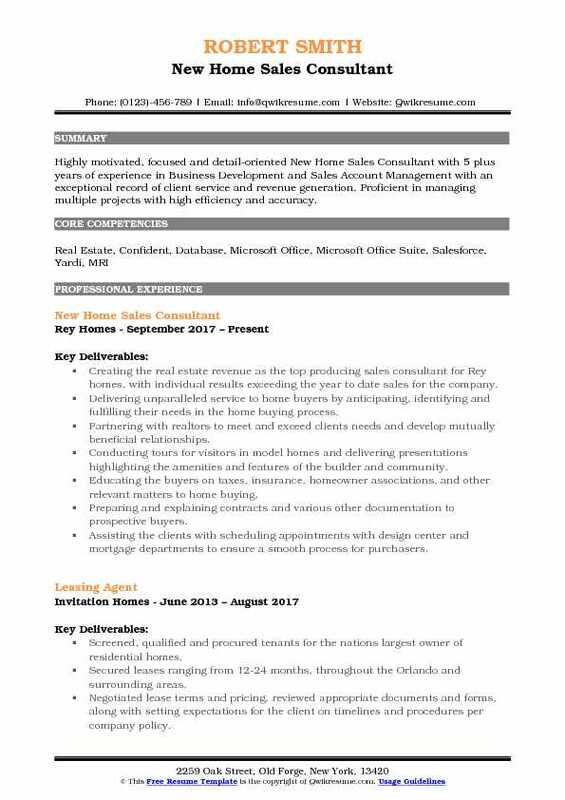 Headline : Highly motivated, focused and detail-oriented New Home Sales Consultant with 5 plus years of experience in Business Development and Sales Account Management with an exceptional record of client service and revenue generation. Proficient in managing multiple projects with high efficiency and accuracy. Creating the real estate revenue as the top producing sales consultant for Rey homes, with individual results exceeding the year to date sales for the company. Delivering unparalleled service to home buyers by anticipating, identifying and fulfilling their needs in the home buying process. Partnering with realtors to meet and exceed clients needs and develop mutually beneficial relationships. Conducting tours for visitors in model homes and delivering presentations highlighting the amenities and features of the builder and community. Educating the buyers on taxes, insurance, homeowner associations, and other relevant matters to home buying. Preparing and explaining contracts and various other documentation to prospective buyers. Assisting the clients with scheduling appointments with design center and mortgage departments to ensure a smooth process for purchasers. Providing the follow-up and service to clients throughout all phases of the sales process. Ensuring that customers are well-informed of all necessary logistics of buying a new home and respond promptly to all queries. Objective : Motivated New Homes Sales Consultant professional versed in all aspects of real estate transactions, including managing the development and execution of representation contracts, purchase agreements, closing statements, deeds and leases. 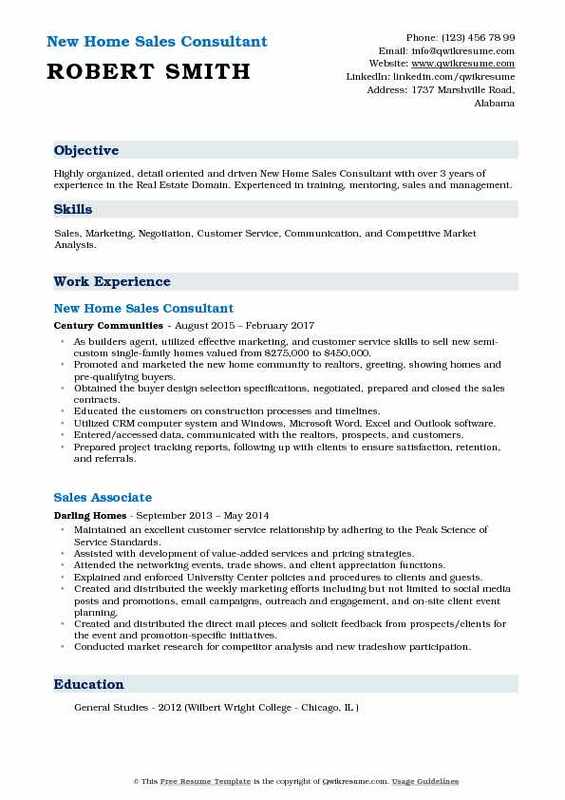 Dedicated sales and marketing professional who exceeds goals, retains customers and maintains a strong reputation for customer satisfaction. Embracing the opportunity to utilize and transfer my success in B2B sales and new business development into the residential real estate industry by accepting the offer to join this developer's elite team of new home sales consultants. Personally meeting with walk-in and scheduling the potential buyers from across NE Ohio at these custom builders Ravenna. Development where multiple model homes ranging from $130,000 - $500,000+ are available to tour and/or discuss. Leading tours while highlighting each model homes particular customizations and features provided by local and national vendors. Assisting the clients in narrowing down the particular plan that would be best for their needs and budget, reviewing their "personal values" notes and making recommendations on how they can include those "must haves" in their new home. Qualifying the buyers, identifying each clients current residential situation and whether or not they are looking to purchase land. Coordinating and responding to complex customer building requirements, prospect new business by networking, realtor/builder events, office presentations, market creative and phone-a-thon activities. Sold homes in the price point of $560-$1.2million. 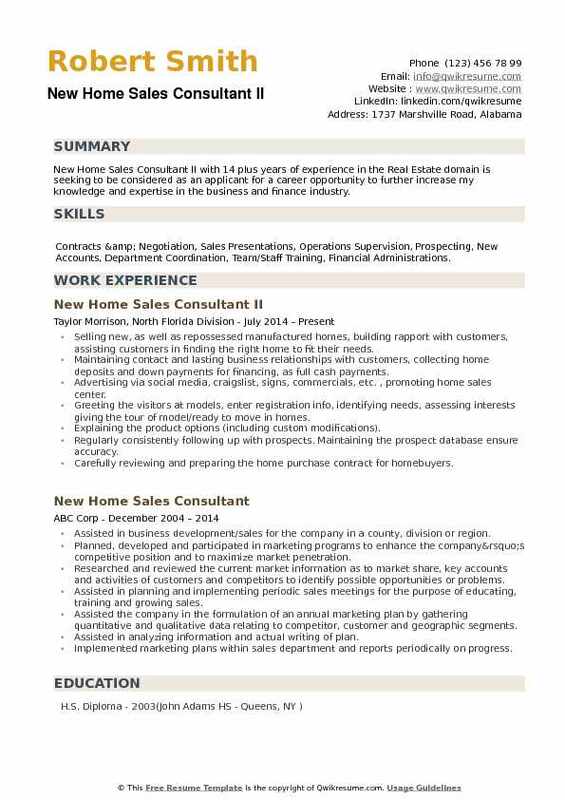 Summary : New Home Sales Consultant II with 14 plus years of experience in the Real Estate domain is seeking to be considered as an applicant for a career opportunity to further increase my knowledge and expertise in the business and finance industry. Skills : Contracts & Negotiation, Sales Presentations, Operations Supervision, Prospecting, New Accounts, Department Coordination, Team/Staff Training, Financial Administrations. Selling new, as well as repossessed manufactured homes, building rapport with customers, assisting customers in finding the right home to fit their needs. Maintaining contact and lasting business relationships with customers, collecting home deposits and down payments for financing, as full cash payments. Advertising via social media, craigslist, signs, commercials, etc. , promoting home sales center. Greeting the visitors at models, enter registration info, identifying needs, assessing interests giving the tour of model/ready to move in homes. Explaining the product options (including custom modifications). Regularly consistently following up with prospects. Maintaining the prospect database ensure accuracy. Carefully reviewing and preparing the home purchase contract for homebuyers. Ensuring the purchase agreement, addendums disclosures are in compliance prior to submission to the main office for processing. Maintaining rapport with homeowner throughout construction process through weekly communication by addressing complete reporting, competitive market analysis, sales associate activity reports other documentation as required by management.